Nyepi is a Balinese "Day of Silence" that is commemorated every Isakawarsa (Saka new year) according to the Balinese calendar. 27th Mar - Nyepi Eve | Ogoh Ogoh Parades all over the island starting late afternoon, till late at night. 28th Mar - Nyepi Day - Day of Silence - complete 24h shutdown of the island beginning 6 am, including airport! 29th Mar - 6.am life goes back to (almost) normal, temple ceremonies and celebrations everywhere. Meditation and reflection. 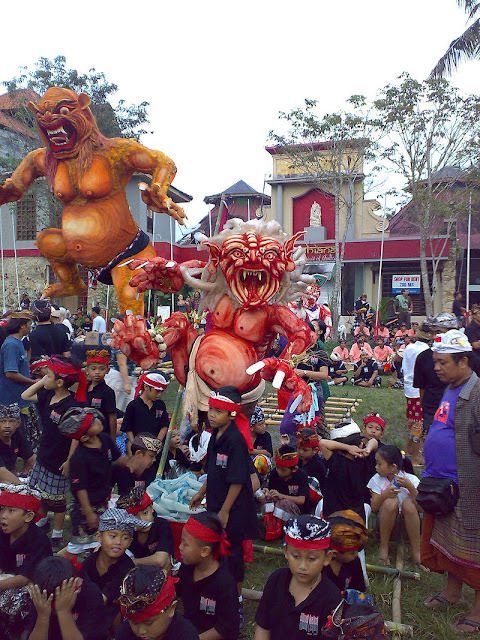 It is a Hindu celebration mainly celebrated in Bali, Indonesia. Nyepi, a public holiday in Indonesia, is a day of silence, fasting and meditation for the Balinese. The day following Nyepi is also celebrated as New Year's Day. On this day, the youth of Bali practice the ceremony of Omed-omedan or 'The Kissing Ritual' to celebrate the new year. The same day celebrated in India as ugadi. The last day of the year includes processions of Bhuta (demons, above), followed by Nyepi, the festival of silence. Second, The Bhuta Yajna Ritual is performed in order to vanquish the negative elements and create a balance with God, Mankind, and Nature. The ritual is also meant to appease Batara Kala by Pecaruan offering. Devout Hindu Balinese villages usually make ogoh-ogoh, demonic statues made of richly painted bamboo and styrofoam symbolizing negative elements or malevolent spirits. After the ogoh-ogoh have been paraded around the village, the Ngrupuk ritual takes place, which involves burning the ogoh-ogoh.